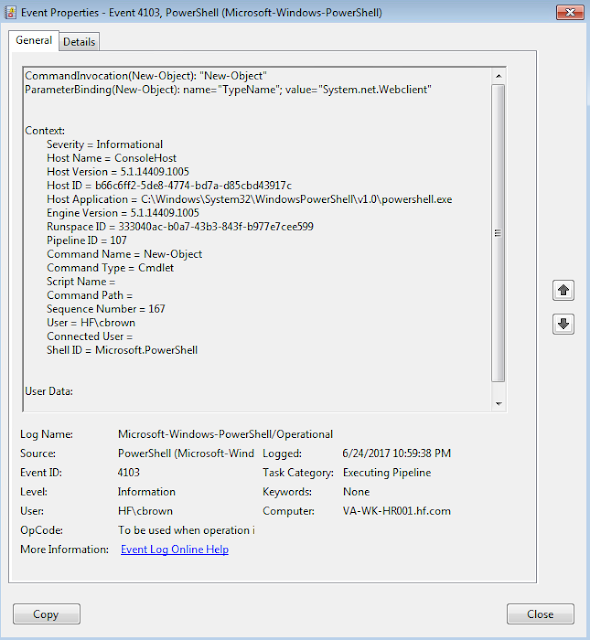 A couple of weeks ago, I was asked how useful enabling enhanced PowerShell logging is for a Threat Hunter and how easy it is to ship its logs to an ELK stack for analysis. 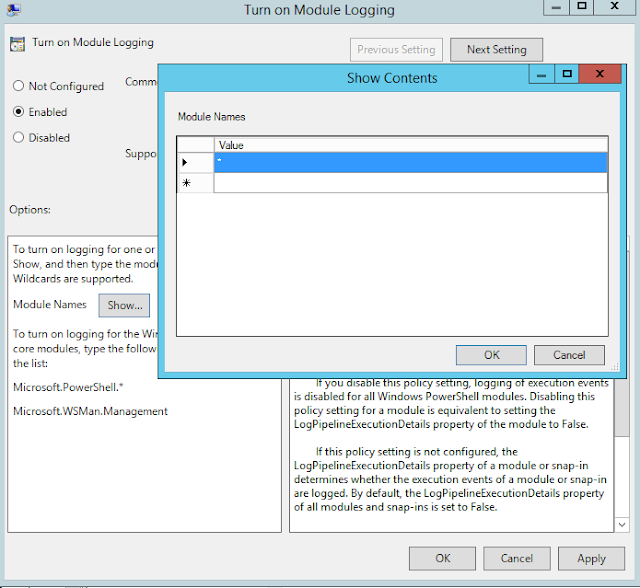 First, when I say enhanced PowerShell logging, I mean enabling Module & Script Block Logging. Those two enhancements started with Windows Management Framework (WMF) version 4.0 and 5.0 and are very useful to log PowerShell pipeline execution details and all blocks of PowerShell code as they get executed (Helpful against encoded and obfuscated scripts). Several experts have already explained the benefits of those enhancements in more details, but only a few have shown detailed steps for the implementation, consumption and analysis of the logs. 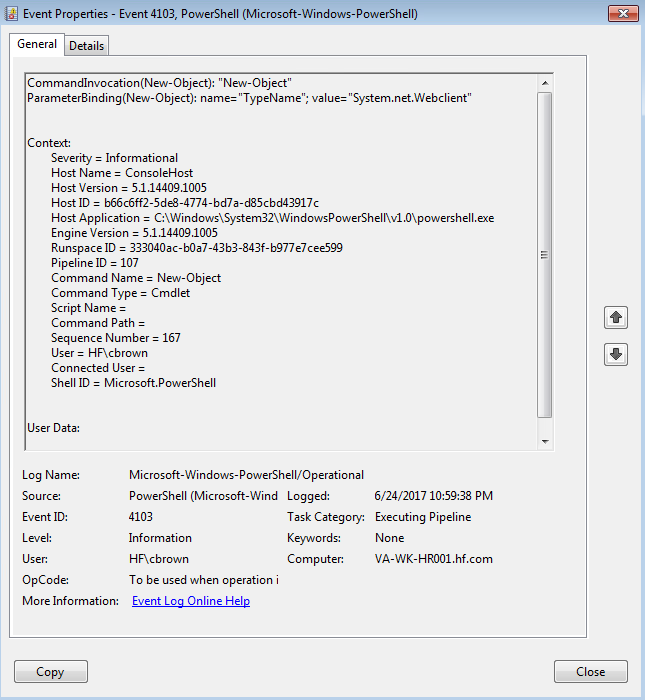 In this post, I will show you how you can enable enhanced PowerShell logging in your lab environment, create a Logstash Filter for it, and integrate it with other logs to improve your endpoint visibility while hunting for adversaries leveraging PowerShell (not just powershell.exe) during post-exploitation. I recommend to read my series "Setting up a Pentesting.. I mean, a Threat Hunting Lab" to help you set up your environment if you haven't set up one yet. After downloading the correct package for your computer's architecture, open a Command Prompt window with elevated user rights (Run as Administrator). On the Server Core installation options of Windows Server 2012 R2 or Windows Server 2012 or Windows Server 2008 R2 SP1, Command Prompt opens with elevated user rights by default. On computers that are running Windows Server 2012 R2 or Windows 8.1 x64, run Win8.1AndW2K12R2-KB3134758-x64.msu /quiet. 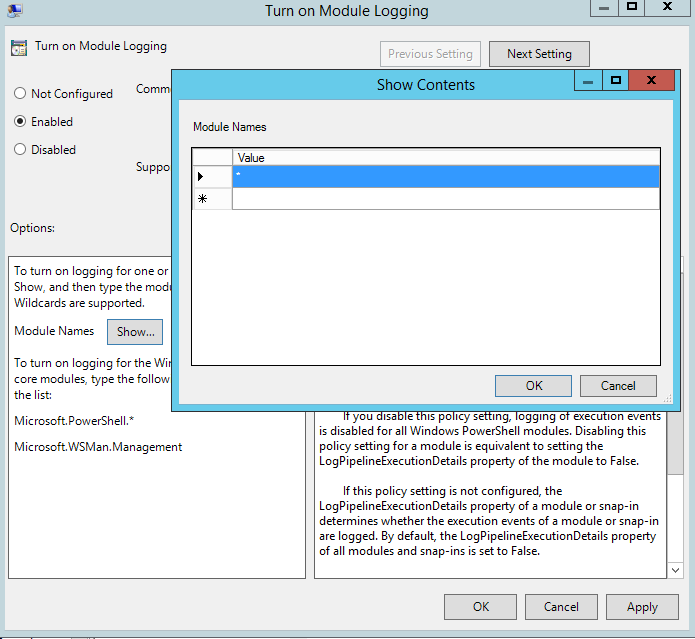 On computers that are running Windows Server 2012, run W2K12-KB3134759-x64.msu /quiet. On computers that are running Windows Server 2008 R2 SP1 or Windows 7 SP1 x64, run Win7AndW2K8R2-KB3134760-x64.msu /quiet. On computers that are running Windows 8.1 x86, run Win8.1-KB3134758-x86.msu /quiet. On computers that are running Windows 7 SP1 x86, run Win7-KB3134760-x86.msu /quiet. Once you select enabled, the "Show" options next to "Modules Names" will be available. Why do we need a Logstash Filter? We can tell that our enhanced PS logging works, and we were good to start sending our logs to a central repository (ELK Stack). However, if we take a look at how the data is shipped to our ELK specially EID 4103, you can see that our event data is split in two fields [event_data][Payload] and [event_data][ContextInfo] as shown in figure 22 below. Now, [event_data][Payload] should give us our modules information, but Payload has everything as a long string which is then stored as a long string in elasticsearch without creating extra fields. Json representation as shown in figure 22 shows what I am talking about. Thank you to Nate Guagenti @neu5ron , the initial filter configuration went from a basic/simple one to a more advanced config. Thank you very much for your help Nate!! "[event_data][ContextInfo]", " = ", "="
Restart your logstash service as shown in figure 24 below. Make sure you monitor your Logstash logs to make sure everything runs smoothly. If you encounter an error, check your configuration and restart your logstash service. Browse to your Kibana IP and if you repeat the basic command you executed to test your PS logging, you should now be able to see tree new extra fields that you can add as columns when visualizing your 4103 logs. If you notice the fields related to your PowerShell logs (even with your new custom fields) have a "?" to the left of the field name and a yellow triangle as shown in figure 26 below, That is because you need to refresh your fields lists in your ELK stack. Go to Management and refresh your field list as shown in figure 27-28 below. You should be able to now see how useful having the data parsed properly is when you put the events in a timeline view as shown in figure 30 below. You could also add the custom fields and the enhanced PS logging fields to a dashboard to improve your 360 view of your environment. This is very useful to monitor PowerShell activity in your environment in a more detailed perspective. Ready to test a PS Empire Stager? Figure 33: Web server ready. You can see that the Script Block Text field captured the initial command used to download and execute the stager. Remember the column names so that you can follow several of the images below that I could not show the column headers. Also, pay attention to the combination of events in picture 38 below. You can see Windows event 4688 (Process Creation), 4104 (Script block Script) & Sysmon EID 1 (Process Creation). This is the ONLY time that you will see all those events capturing the initial execution of the stager in the victim's computer. Starting from here, nothing gets executed on disk for which you will not have 4688's neither Sysmon EID 1's tracking the rest of the script/commands being executed on the victim's computer. However, you will start seeing 4103 & 4014 capturing the rest of the PowerShell activity. Now, you might be asking yourself why the Script Block text field has encoded strings and not showing them as decoded strings? Take a look at figure 39 & 40 below. Script Block logging captures both states. We can see information being gathered from the system via WMI as shown in figure 42 below.. Finally, our Beaconing pattern from a host perspective :) Very useful! I hope this post was helpful to those that were not that familiar with the benefits of enhanced PowerShell logging and with the process of implementing this in your environment. In my next posts, I will be using this same approach and new logging capabilities in order to document patterns and events that get created by several post-exploitation techniques available in PowerShell Empire.